As promised, here are some pics and the recipe links for the “BP Sunday” treats I made and brought to the ceremony this past Sunday. I have posted the recipe for this divine cake before (link here) so I won’t repeat it now; I’ll just show the pics of the final product. This is a super-delicious, incredibly moist cake, and it got rave reviews from all who had some! This recipe makes two 8″ rounds or one 11″x15″ pan. The only changes I made to this recipe were that I substituted about 1/2 cup of coarsely chopped walnuts for the raisins, omitted the cardamom (I didn’t realize I had run out, oops) and upped the nutmeg by 1/4 tsp to compensate. As for the frosting, I put a small amount aside and tinted it orange and green, then used two small paper cones, a #5 plain tip for the orange, and a grass tip for the green, to pipe the carrots (also an excellent visual aid for how large the serving slices should be depending on your need). 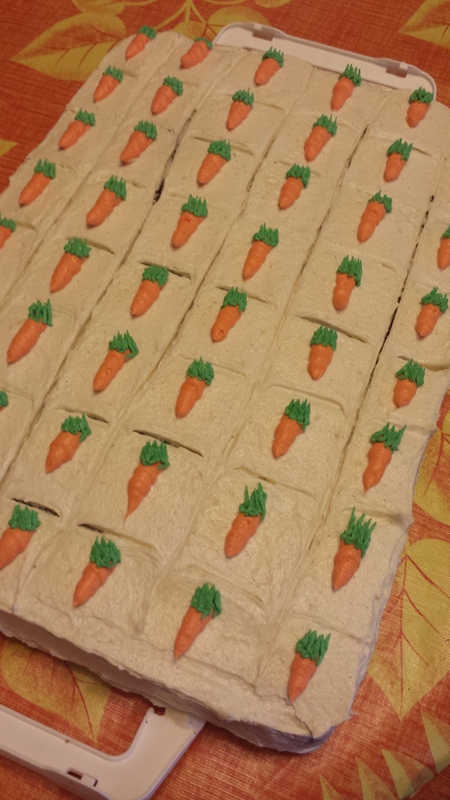 Since this was for a church tea, I made enough piped carrots for 48 bite-sized servings. 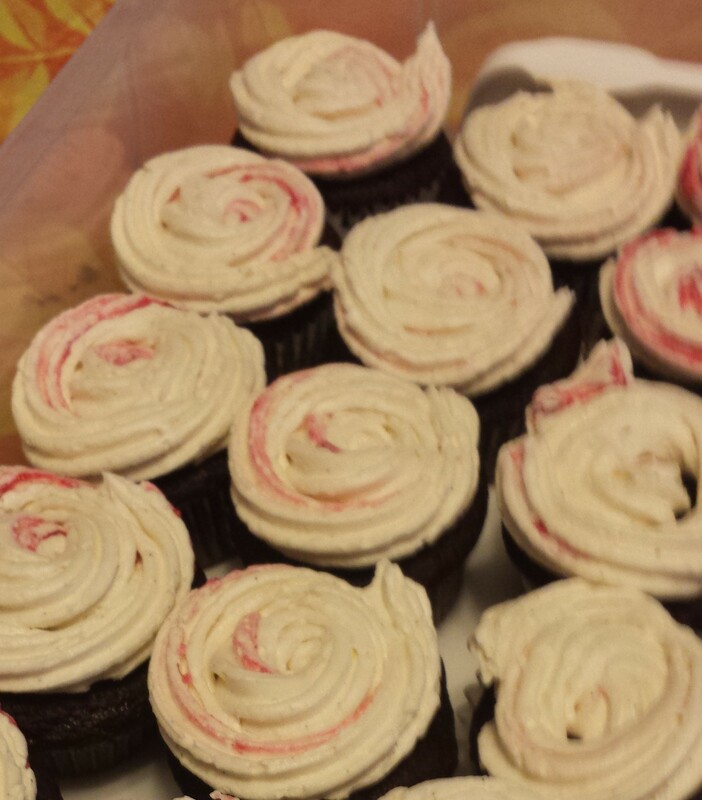 Secondly, I made about 3 dozen mini chocolate cupcakes with vanilla bean frosting, with a tart little raspberry swirl running through it. This recipe is my absolute “go-to” for a ridiculously delicious (ridiculicious?) and rich chocolate cake which doesn’t need any more carving or shaping than a good torting (making horizontal layers). As this recipe uses no eggs, it is not a cake that can withstand much handling; treat it gently and allow it to cool completely, wrapping and refrigerating cake layers overnight to allow it to stabilize. This recipe will make two 8″ rounds or 24 standard sized cupcakes or 48 mini cupcakes. Mix vanilla, lemon juice, melted butter, and lukewarm buttermilk in a measuring cup; pour the liquid over the dry ingredients. Stir and blend until smooth and no flour is showing; do not over-mix or batter will toughen. 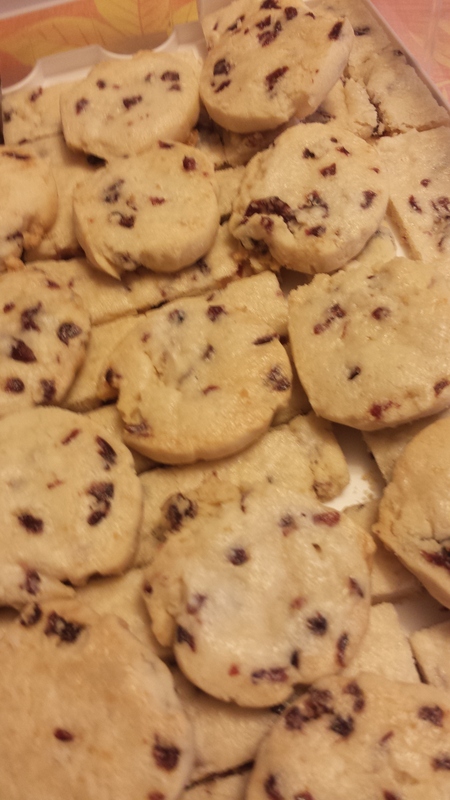 Lastly, I baked off a delicious cookie recipe, of which I had made and frozen the raw dough several months previously. 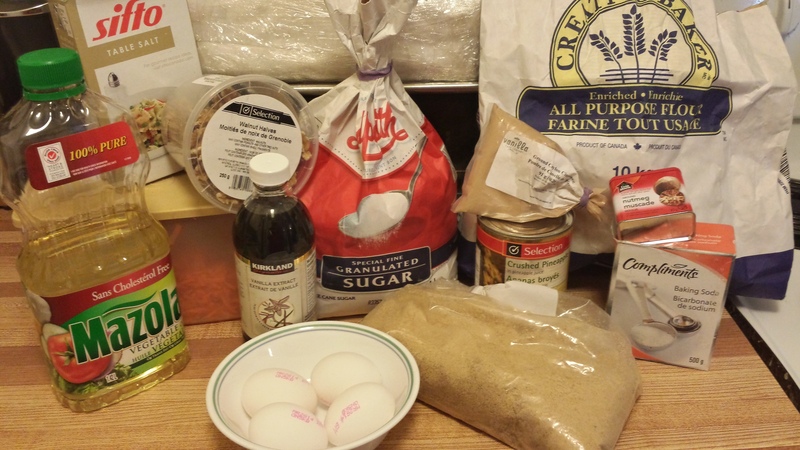 In a medium sized bowl, whisk together flour and baking powder. In the bowl of an electric mixer, whip butter, sugars and vanilla for about 5 minutes or until well blended. Mix in cranberries. Using a wooden spoon, blend flour into butter mixture. Mixture will be sandy and dry. 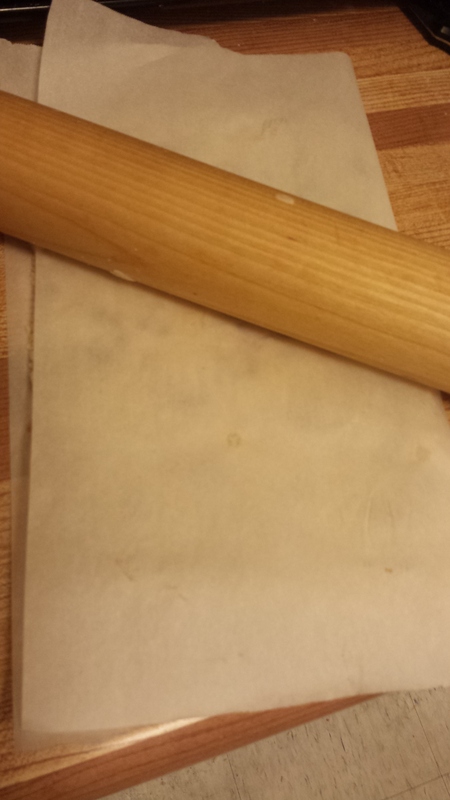 On a large piece of parchment paper, roll half of the dough into a 1-1/2″in diameter log. Square off ends and tightly wrap in parchment. Repeat with second half of dough. Wrap both logs together in aluminum foil and refrigerate a minimum of 2 hours. Place rack in center of oven and preheat oven to 350°F/180°C. Remove dough from foil and parchment paper and place both logs on flat surface. Cut slices about 1/3″ thick and place on baking trays lined with parchment paper, spacing about 1/2″ apart. Lightly glaze cookies with milk and sprinkle tops with sugar. Bake for approximately 12 minutes or until cookies start to turn golden brown. Let cool on racks. The funny thing about the above recipe is, because I had waited SO LONG between when I first made the dough and when I finally used it, the sandy texture of the cookie dough had turned into super dry-dry-dry, and I had the Devil’s own time slicing it properly! However, I persevered. I didn’t want to add any more moisture, mainly because I would have to re-mix and re-roll the dough, then let it rest in the fridge, and I knew that there was no guarantee I wouldn’t have made them worse. This recipe is somewhat like shortbread; if you play with the dough too much, the oils from the butter warm up and start to leach out of the cookie, causing an unappetizing, brittle mess. Because I was thinking of shortbread’s consistency at that moment, looking at my mound of cookie dough crumbs, I was zoinked! in the head by a memory. When a friend and I were going through Pastry School way-back-when, we both interned at a fancy-pants restaurant that had its own bakery department (a big thing these days; most restaurants don’t make their own baked goods or breads, but purchase them from wholesale manufacturers). Anyway, one of the recipes we made quite often was fig newtons, but with a homemade shortbread crust both top and bottom. 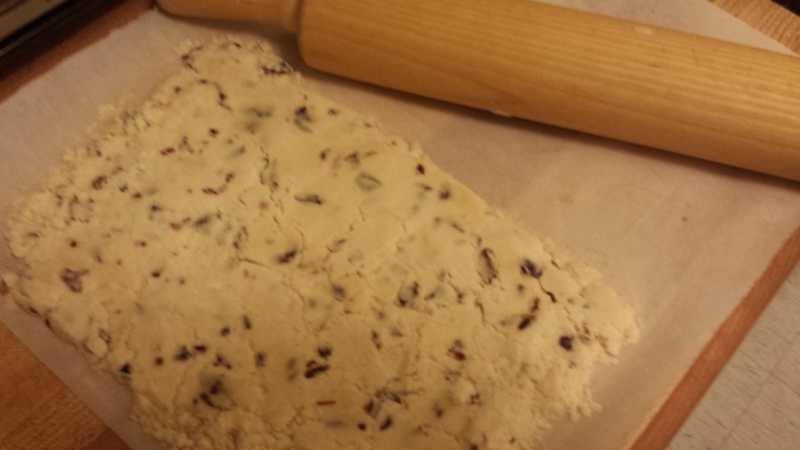 And the way to make a thin shortbread crust that wouldn’t break and crack and be ruined? Roll it between a folded over sheet of parchment paper! Simple yet brilliant. 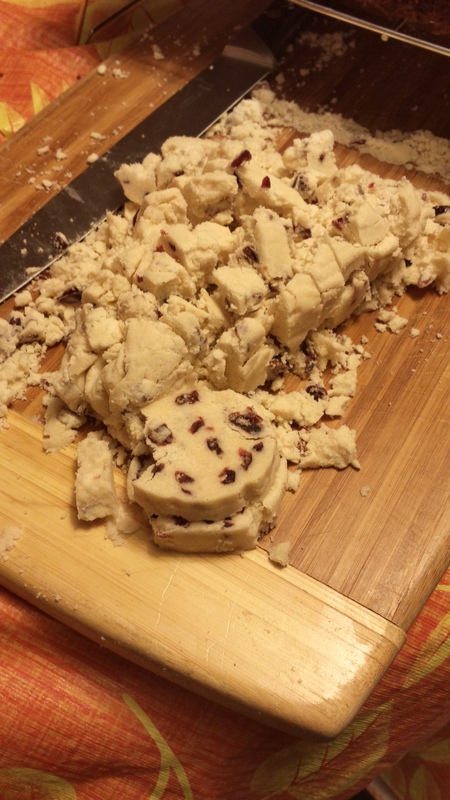 So I did that with the crumbs, and made a couple of “sheets” of cranberry cookie dough, which I then baked off; when they were baked, I simply sliced the still-warm sheet into bars, and Bob’s yer uncle. They were so popular, I think there may have been 5 cookies left on the gigantic tray, which were quickly “dispatched” (i.e. gobbled up) at clean-up. I hope you enjoyed this little recipe-palooza, and I look forward to seeing your comments and links to your own creations from one of my recipes!